When word came that ITT Technical Institute — a chain of for-profit career colleges accused of engaging in fraudulent practices — had abruptly closed its doors last month, Matthew Jackson, a military veteran, went looking for answers. Unlike many other students who became eligible for federal student-loan forgiveness as a result of ITT Tech’s deceptive practices, Jackson hasn’t taken out any personal loans. 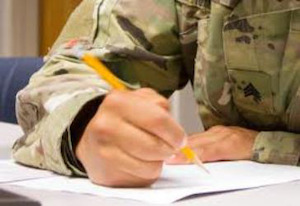 His tuition and housing allowance are made possible through the Department of Veteran Affairs (VA), and are subject to a separate set of regulatory and financial constraints. Jackson, however, does not want the VA to penalize his benefits for the time that he spent at ITT Tech, which was forced to shut its doors after it was accused of pressuring students to take out predatory loans and spending too much money on marketing. The U.S. Department of Education has said that it will help students transfer existing credits or get the loans for ITT Tech classes wiped clean from their records. But the plight of veterans, about 7,000 of whom were attending ITT Tech classes, remains a bit unclear, according to U.S. Sen. Sherrod Brown, D-Ohio, who has been pushing legislation that he says will bring about “much-needed relief ” to veterans who were exploited by the for-profit giant. For now, the veterans and their families who attended an ITT Tech school using the GI Bill cannot have their GI benefits restored. But Brown wants to change that. Meanwhile, the American Legion — the largest wartime veterans organization with 2.2 million members in more than 13,000 posts across the nation — says that it has begun supporting federal efforts to assist student veterans who were impacted by the closure of ITT Tech by providing educational counseling through its service officer network. “We are deeply troubled by ITT Tech’s abrupt closing and the blockade it has placed in front of veterans seeking higher education,” says American Legion Commander Charles E. Schmidt. In the aftermath of ITT Tech’s shutdown, more than 40,000 students were summarily bereft of their school and left with potentially unusable credits. The closure of all 136 ITT Tech campuses occurred practically overnight, almost at the beginning of the semester. While the school’s closure has been disruptive to students’ lives and plans, many ITT Tech students have already appealed to the U.S. Department of Education (ED) for redress. ED is encouraging institutions to reach out to former ITT Tech students, and colleges and universities are acting quickly in response. Institutions across the country have announced plans to host open houses and informational fairs where students can receive on-the-spot assistance in transferring to the institution. ED has also hosted informational webinars for displaced students throughout September. A directory compiled by Chegg, a California-based online textbook retailer, shows a state-by-state list of institutions willing to accept ITT Tech credits. While players across the higher education sector are taking action, it remains to be seen how the transfer process will work out in practice. For example, the State Council of Higher Education for Virginia (SCHEV) says that 1,627 ITT Tech students were enrolled in Virginia campuses when the institution closed, a number that is substantially less than the approximately 4,500 students reported to be enrolled at the close of last semester. That figure is also nearly 1,000 students less than the enrollment figures originally reported to the council at the time of ITT Tech’s closing. Although there is no official explanation for the dropoff in student enrollment, ED had prohibited ITT Tech from enrolling new students using federal financial aid a few weeks before ITT Tech closed up shop. In a statement, SCHEV noted that a number of Virginia workforce oriented-institutions will provide assistance to displaced students, including the Virginia Community College System, member institutions of the Virginia Career College Association, and other public and private institutions. In Maryland, approximately 700 students were attending ITT Tech at the institution’s two Maryland campuses, which are located in Hanover and Owings Mills, according to the Maryland Higher Education Commission (MHEC). The commission is “‘building the plane as we fly it,’ trying to give these students a second chance to complete their education,” says MHEC Director of Communications and Outreach Maria Torres. James Fielder, Maryland’s Secretary of Higher Education has asked two- and four-year schools interested in reaching out to ITT Tech students to submit formal proposals to the MHEC, according to Baltimore City Community College (BCCC) officials. Maryland community colleges have already begun holding informational open houses for ITT Tech students. “We have everybody on standby ready to move forward,” says Dr. Daphne R. Snowden, BCCC dean of academic operations and services. BCCC officials say the college has reviewed course catalogues at the ITT Tech campuses in Maryland. ITT Tech programming in accounting, computer information systems, computer aid, drafting and design, and business management align with BCCC course offerings, and credits acquired in those areas would be eligible in some cases to transfer to BCCC. In the meantime, veterans like Matthew Jackson are hoping for a seamless transition back to college. Staff writer Catherine Morris contributed to this article. She can be reached at cmorris@diverseeducation.com. Jamal Eric Watson can be reached at jwatson1@diverseeducation.com.